I had wanted to make a 3-D cake for my 3 year old’s upcoming 4th birthday ever since I saw some on The Coolest Homemade Birthday Cakes website. 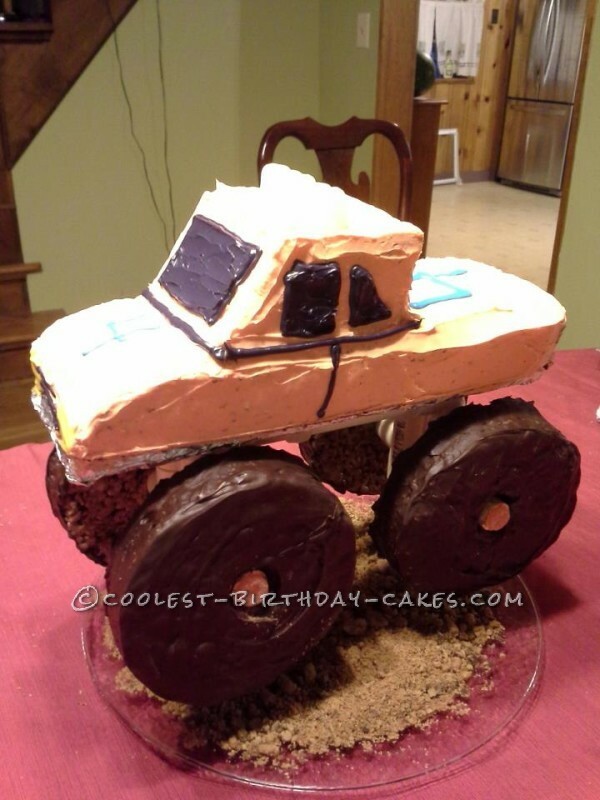 He had been recently obsessed with monster trucks, so I figured making a giant cake for him would be a huge hit. It might also serve to make me look like super mom to the under 5 crowd, and maybe to my adult friends and family too. The planning was where the “fun” started. If you are making a 3D cake, it can’t just stand on it’s own. You can’t stack cake upon cake, and cross your fingers that it will stay upright. From what I saw from other cakes on the website, I would need a base. This is where my poor husband gets roped in to my idea to make the best birthday cake any 4 year old could ever wish for. He went to the local hardware store, bought some PVC pipes, and constructed a fantastic skeleton for the cake to sit on. Complete with wheel spokes and a clear plastic plate attached to the bottom for the necessary details, like cookie dirt, that I wanted to put under the cake. So, now my framework and base are complete. Here comes the easy part: making the cake. I made 1 boxed cake mix in a 9×13 pan, and purchased a store made pound cake. All I would have to do was carve them into the shapes that would resemble a monster truck. Simple! Or…not! I cut the 9×13 cake down the middle lengthwise, and stacked the 2 pieces on top of each other for the body of the truck. OK, so far, so good. Now, for the cab. I hacked into the pound cake, trying to make a shape that resembled a triangle, but it was a disaster. 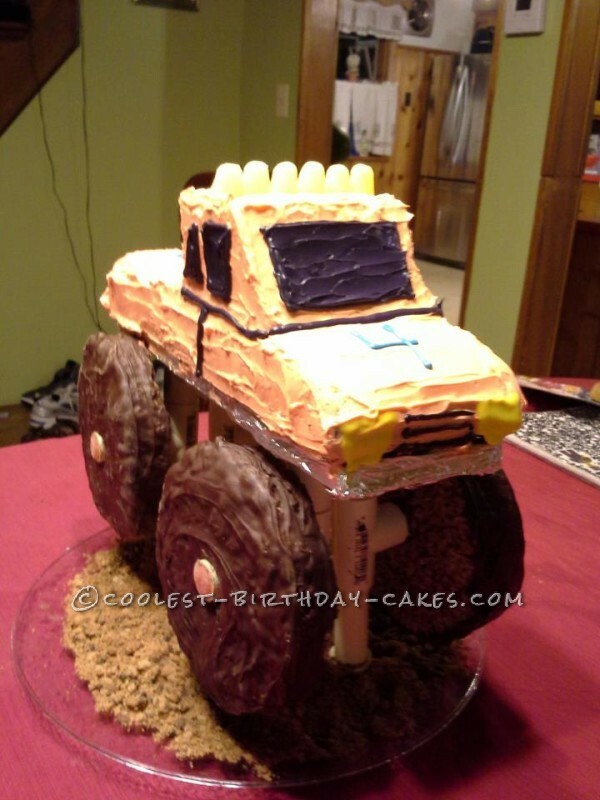 Thank goodness for my patient husband, who came to the rescue again, and carved the pound cake into what perfectly looked like a monster truck form. I then frosted it with vanilla icing that I colored orange, for my boy’s favorite color. I attached yellow gum drops to the top for the lights and just piped the rest of the details on with colored frostings. But wait! What about those gigantic tires that monster trucks have? I had planned on just throwing 4 chocolate donuts on that bad boy and calling it a day. One problem: chocolate donuts are nowhere near big enough for this ginormous structure of cake that we have created. I decided to go with Rice Krispie Treat tires. They are pliable, and I can make them whatever size that I want. But, don’t go sticking your hand into a molten bowl of Rice Krispie treats the second you finish making them! That will burn your hand, and you will be covered in marshmallow goo (take my word on that). Next idea: spread the treats into a 9×13 pan, and carve around them with a bowl the size of the tire you want. I had to make 2 batches in order to get 4 giant tires. Perfect! I used an extra piece of the PVC pipe to bore a hole in the center to ensure it would fit on the spokes that were pre made. Great, things are going well. However, tires are black, and these are beige. Light bulb! Cover them in chocolate. I melted chocolate chips, one 16 oz bag at a time. Each tire took a whole bag of chips to cover it. Once they were set up, all I had to do was place them on the frame. Not so fast! The chocolate had collected in the hole in the middle, hardened, and made it smaller than the original hole, therefore not allowing it to simply slip into place. I bring my trusty piece of spare PVC pipe back out, and whittle away at the excess chocolate until it fit. Whew! I crushed up a bag of chocolate chip cookies for the aforementioned cookie dirt (hubby was not convinced that a $4 bag of cookies being used just as a crushed up garnish was a frugal decision, but, it tied the whole thing together) and spread it around the bottom of the cake. The cake was a hit! I was queen of the 4 year olds, and the envy of my family and friends. I made it look so easy. If they only knew the real story!! Side note: I also made a 3-D princess doll cake for my 8 year old’s birthday party on the same day. Their birthdays are only a week apart, and we always have a joint party. One cake can’t outshine the other, so mom goes a little crazy for one day a year.